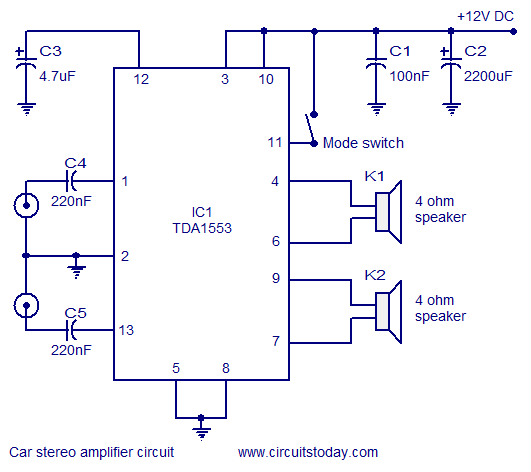 Given below is the circuit of a car stereo amplifier that can be used in cars or other vehicles. We have used TDA1553, which is a Class-B audio amplifier. Here is the circuit of a car stereo amplifier based on TDA1553. TDA1553 is a monolithic Class-B audio amplifier which contains 2 x 22 watt amplifiers in bridge tied load configuration. The amplifier operates from 12V DC and is developed intentionaly for car audio applications. The IC also has a load of good features like short circuit protection, load dump protection, reverse polarity protection, loud speaker protection etc. In the circuit , C5 and C4 are input decoupling capacitors while C3 sets the delay time for loud speaker protection. C1 and C2 are power supply filter capacitors. Use 12V DC for powering the circuit. The circuit can deliver 22W per channel into 4 ohm speakers. Fit the IC with a proper heat sink. We are a specialized manufacturer for car amplifier and capacitor for 18 years in China, could offer you the best competitive prices with high quality and good service. If there is anything I can do for you,please don’t hesitate to contact with me. Looking forward to working with you in the near future. I want to make an electronic circuit of car stereo amplifier. so i want capacitor of 100nF . and i have here 2 capacitors with me 1000uF and o.1uF . which capacitor will give me same effect as 1oonF ? on every capacitors tolerance as 100uF and voltage as 10v are mentioned. but i have noticed in same circuit that they have not mentioned voltage of capacitors. which voltage capacitor should i take in this circuit? kindly help me sir. 100nF is nothing but 0.1uF (1000nF = 1uF) 1000uF is 1000000nF. In the car environment it is better to use all capacitors, rated for minimum of 25 volts. DEAR,0.1UF OR 100NF BOTH ARE EQUALLY SAME. its not labelled with Rin and Lin, but in the drawing its already there!!! what are various uses of TDA 2003 Other than amplifier?